Can anyone help me figure out how to convert my YoWorld photo, so the animations can be seen? I cannot figure it out! Sigh! Location: Some just like to argue; they never get the point! Lol! SMH! We're so glad you didn't keep those gardens a secret! Our last challenge brought amazing decorations inspired by our SG2017 theme - check out the winners and all the awesome entries by clicking here! This week, the Facebook Fanpage Feature Challenge finds something that Spring and Weddings have in common... Decorate a room for this week's challenge theme: Love Is In The Air! This week, 5 winners will each get a prize of 35 YoCash, and have their designs featured on our Fan Page. The deadline for entry is next TUESDAY, April 11th at 12:00pm NOON (EDT). Lovely creations abound from last week's Love Is In The Air Challenge theme! 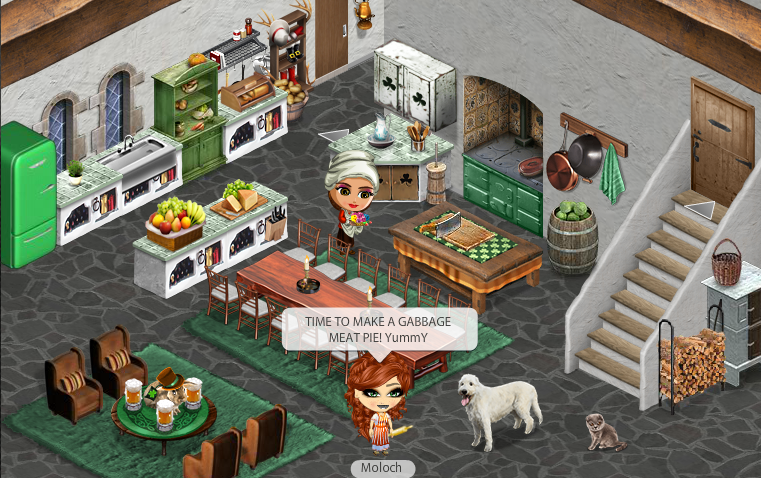 Seriously, check out the amazing rooms YoFans created by clicking here! That chocolaty, eggy time of year is quickly approaching, so this week's Challenge theme is Easter! We're all about seeing how YoFans celebrate (or don't celebrate) different tradtions - so show yours off and you could win a spot on our Fanpage! This week, 5 winners will each get a prize of 35 YoCash, and have their designs featured on our Fan Page. The deadline for entry is next MONDAY, April 17th at 12:00pm NOON (EDT). ARE WE ALLOWED TO USE THE EASTER HOUSE ? Mandy (6726637) wrote: ARE WE ALLOWED TO USE THE EASTER HOUSE ? You pulled out all the stops for last week's Easter Challenge! Check out the amazing rooms - and our most recent winners - right here. With YoWorld's 3rd anniversary quickly approaching (WHERE DID THE TIME GO ), we've got a killer Feature Challenge comin' atcha! Our week 31 special edition Fanpage Feature Challenge theme is... FREE FOR ALL! We want to see the very best Yo has to offer, so you choose your theme this week! Make sure to share your inspiration or a description of your room in your entry. This week, 10 winners will each get a prize of 35 YoCash, and have their designs featured on our Fan Page. The deadline for entry is next MONDAY, May 8th at 12:00pm NOON (EDT). I've got a whole barrel by the stove! Juuuust wow. Seriously, check out the winners and amazing entries from last week';s challenge. You guys are amazing. For Week 32, we thought we'd remind you that Mother's Day is this weekend! (For some countries, anyway.) This Fanpage Feature Challenge theme is Mother's Day! Celebrates moms and those who fill the role of 'mom' in an awesome creation. This week, 7 winners will each get a prize of 40 YoCash, and have their designs featured on our Fan Page. The deadline for entry is next MONDAY, May 15th at 12:00pm NOON (EDT). Hi, Can I post a picture of 2 rooms, but as one entry only? It is supposed to be a 2 floors. You guys don't listen very well. I asked you to stop being so good at this, but noooo. Week 33's theme takes advantage of our Mothers Week celebrations... Decorate a room to relax! This week, 5 winners will each get a prize of 40 YoCash, and have their designs featured on our Fan Page. The deadline for entry is next TUESDAY, May 23rd at 12:00pm NOON (EDT). Do we HAVE to purchase ANY NEW items or can we just use all old items that we already have??? For Week 34, we're focusing on Canadian Camping! If you've ever been to the "Great White North", then you know how much we enjoy hanging out in the gorgeous greenery that surrounds us. This week, 5 lucky winners will receive 35 YoCash and have their design featured on our official Facebook Fan Page. The deadline for entry is TUESDAY, July 11th at 12 NOON (EDT). For Week 35, we're focusing on Canada as a whole! If you feel passionately about any of our provinces or territories and want to create a scene that showcases that, please do! This week, 5 lucky winners will receive 35 YoCash and have their design featured on our official Facebook Fan Page. The deadline for entry is TUESDAY, July 18th at 12 NOON (EDT). It's time for another contest! This time we're exploring "A Day in the Life" of 1940s New York. This week, 5 lucky winners will receive 40 YoCash and have their design (and story!) featured on our official Facebook Fan Page. The deadline for entry is TUESDAY, August 4th at 12 NOON (EDT).